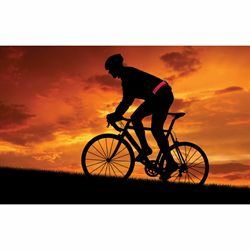 Streamlined and lightweight, the LED Sport Belt is a comfortable, lightweight, all-weather way to be visible when you're out in the dark. Press once to activate the steady red glow that can be seen from all directions; press a second time to activate the flashing mode. A single set of batteries provides up to 200 hours of illumination. Requires 3 AAA batteries, included. Elastic waistband fits sizes 30" to 49"